Square Orchard was a small square(ish) orchard, one of several in the northeast corner of Stone Farm. This area is actually a detached part of the parish of Preston Plucknett, known as Preston in Stone, and the Preston Plucknett Tithe Map of 1849 shows Square Orchard as Parcel 164. It was bounded on the south by Eight Acres (Parcel 165), to the west by Lower Ground (Parcel 156), on the north by Furze Leaze (Parcel 157) and Dairy House Plot (Parcel 159), on the east by Great Orchard (Parcel 163). The Preston Plucknett Tithe Apportionment of 1848 notes that Square Orchard was in the ownership of Henry Goodford Esq. of Chilton Cantello and occupied by Mrs Phillis Coles, as indeed was the whole of Stone Farm at this time. The Tithe Apportionment reckoned the area of Square Orchard to be 1a 3r 31p. 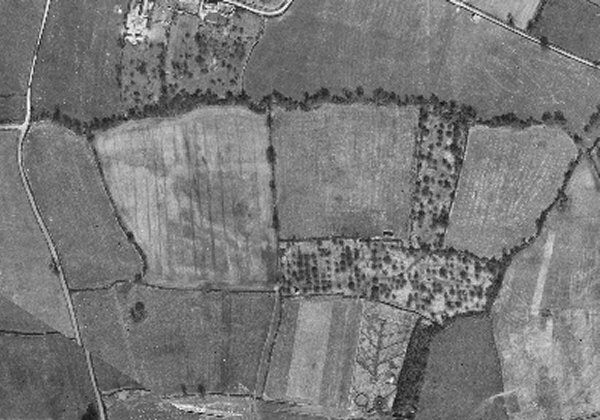 As seen in the aerial photograph of 1946, shown below, Square Orchard still retained its apple trees at this time. 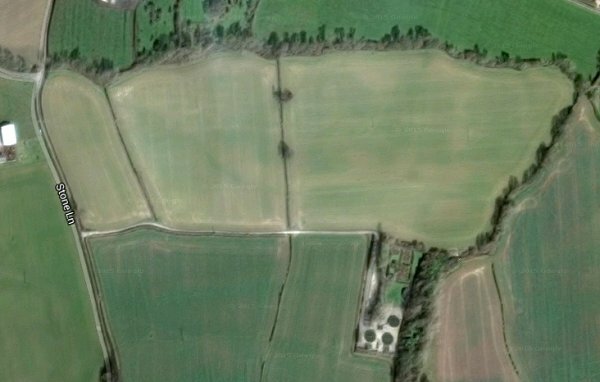 Recently however Square Orchard was merged with all the other fields in this northeast corner of Stone Farm to form the very large present-day field shown in the recent aerial photograph below. 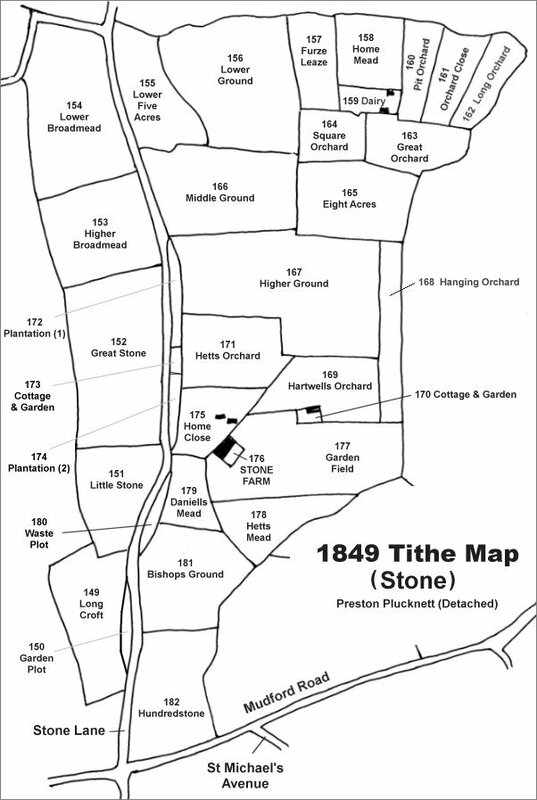 The Stone area reproduced from the 1849 Tithe Map. Square Orchard is at top, right of centre. The 1946 aerial photograph showing Square Orchard at centre, still containing its apple trees. 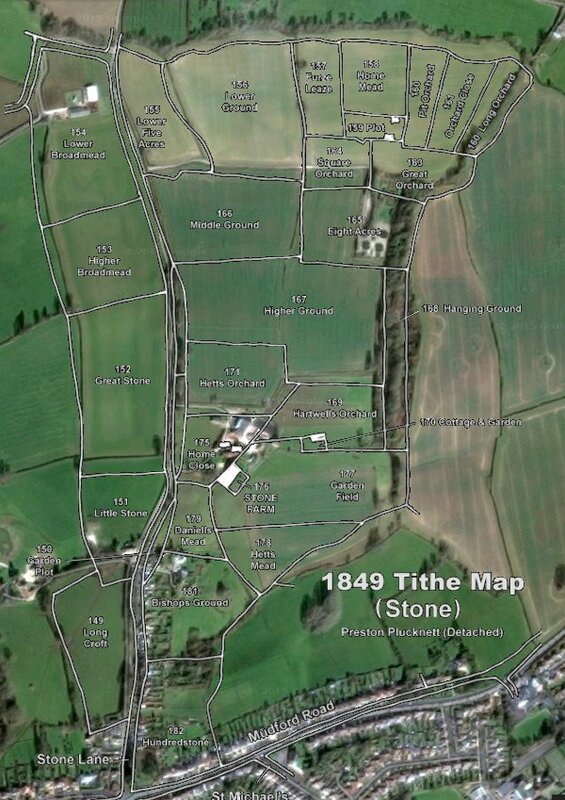 The 1849 Tithe Map superimposed over the current Google Earth image. Although the field boundaries do not align precisely, remember that the 1849 survey was undertaken by hand using primitive surveying equipment. The location of the former Square Orchard is towards the top and right of centre.